Stubby CoreBrake™ is a screw-on muzzle brake designed to reduce felt recoil, eliminate muzzle rise all in a small package. This muzzle brake is designed to fit AR10 factory threaded barrels without any modification. It is manufactured with very precise tolerances to be screwed-on and then fastened. 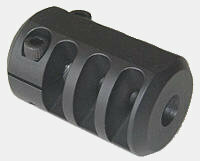 It replaces the factory flash hider without any shims or washers.